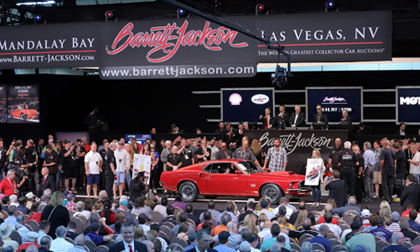 LAS VEGAS – Oct. 16, 2016 – Barrett-Jackson, The World’s Greatest Collector Car Auctions®, featured unprecedented international television coverage and a record number of bidders in Las Vegas during its 9th Annual auction at Mandalay Bay Resort and Casino. After kicking off the event at Drai’s Beachclub and Nightclub for the Opening Night Party, Barrett-Jackson delivered an impressive 99.2-percent sell-through rate with sales totaling more than $32.5 million and $850,000 raised for charity. This year’s Las Vegas automobilia auction was the company’s most successful non-Scottsdale automobilia auction with a total of $777,000, an 8-percent increase over the 2015 Las Vegas auction. The Tammy Allen Collection was a featured attraction during the 9th annual Las Vegas auction. The Collection included some highly-prized vehicles, including the aforementioned 2008 Dodge Viper SRT/10 Hurst 50th Anniversary that sold for $220,000, a 1962 Jaguar XKE Roadster (Lot #698) selling for $165,000, as well as a 1953 Buick Skylark Convertible (Lot #693) and the “Wasabi” 1950 Mercury Coupe (Lot #694), both of which sold for $159,500. Among the auction’s stars was the 1976 “Wayne’s World” AMC Pacer (Lot #608) that sold for $37,400. It set a new world record for an AMC Pacer as the previous record was $18,945. The 46th Barrett-Jackson Scottsdale Auction will be held January 14-22, 2017, at WestWorld of Scottsdale. To consign a vehicle, click here. For more information on becoming a bidder, follow the link to www.Barrett-Jackson.com/Bid.